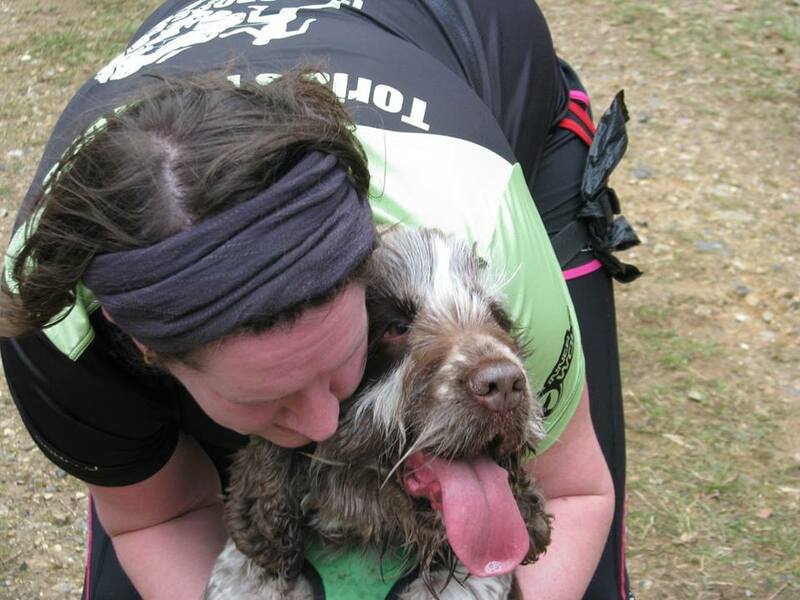 Teaching your dog to swim with you can take time, patience and a lot of understanding, so to make things a little easier here’s a few tips from Toria and her dog Woodi who have attended every Tri Dog event so far! Blue-green algae is a term used to describe a group of bacteria, called cyanobacteria. It isn’t actually algae, but it has it’s named because it gives the appearance of algae when clumped together in the water. It can look like blue-green scum, pea soup, green flakes, green bundles or brown dots in the water and is more common in stagnant water during hot weather, or whenever there is less rainfall. These blooms of blue-green algae can produce harmful toxins which stop a dog’s liver from functioning properly. If in doubt, don’t swim there. Although relatively rare, this is a hazardous effect of your dog ingesting too much water whilst swimming or playing in the water. The condition is brought on by excess water intake and as a result the body’s cells begin to fill with water and swell. 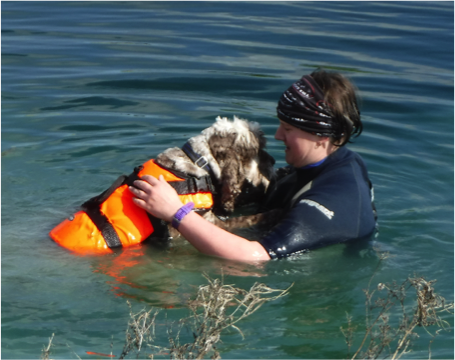 Whilst we take it for granted that dogs can swim and I knew that Woodi was perfectly capable of swimming, I started him swimming with a life jacket for 2 reasons. Firstly, my aim is to get him comfortable and confident in the water, so a life jacket will keep him above the water and prevent any panicking moments that might undermine our confidence building. Secondly, whilst he is learning I would rather be safe than sorry and a bright life jacket will help me spot him should he swim away or get out of my sight for any reason. Now Woodi has never been a goldfish, so whenever we went in the water he would swim to me in a panic and climb up me and cling on like a monkey. So I had to start with the basics and get him to start enjoying his time in the water. The best way to do this was to keep the sessions positive, fun and focused. So whenever he looked to me and focused on me, I praised him and gave him attention. If he panicked and looked away, I got his attention and again immediately gave praise whenever I regained it. limiting time in the water to make the experience short and enjoyable for him. last but not least – praise your dog whenever they focus on you or the toy. Never shout at them or raise your voice because they are scare, remember, we want them to have a positive experience in the water. Once I built Woodi’s confidence in the water and I could consistently get his focus in the water I could start to work on getting him to swim to and with me. I started to walk out into the deeper water with him and tread water as he swim to and around me. If he started to swim away and panic, I would re-focus him on me by calling him and praising him when he swam to me. By encouraging him to swim to me and round me, his focus was constantly on me and his confidence grew the longer we spent in the water together. Again this is not always a quick process, and we never spent long periods of time in the water, we kept the sessions short and fun so the experience got better and better for him. Once he had enough or started to become too distracted or tired we would come out of the water. 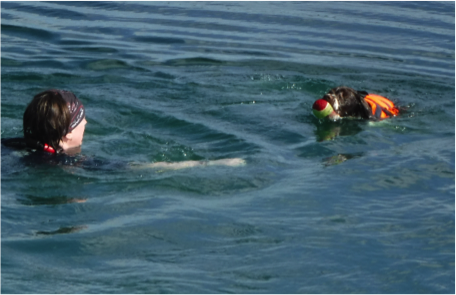 Once we had the basics in place and Woodi was confident to swim, we started to swim to points in the water so he could focus on swimming with commands and developing his skills and confidence more. By understanding how I could get his attention and focus and working on that in our first sessions, I could now call his name and get his attention and he would swim to me as I swam out into the lake. If at any point he was distracted and looked away, I would tread water with him and get his attention and focus back. We started to build on the distance we swam and the more we swam together the more he started to enjoy the experience. Whenever we finished out swim we would always have a play and be happy about the whole experience. Always make sure you dry your dog off and allow them a warm and draught free space to relax and unwind after the session. If you want to start training for a Tri Dog event we recommend you having a look initially at the equipment you will need for the event. This might seem like a lot of equipment but for your own and your dogs' safety, this is the bare minimum you should have to enter our event and you should have trained your dog using the equipment before you attend your first Tri Dog event. ​If you have any questions with regard to equipment please do get in touch with us for advice. Welcome to our new blog where we hope to update you with some training and event tips for you and your dog throughout the summer so you can see how we have all trained for the event and our techniques for over-coming any problems you might encounter in your training.